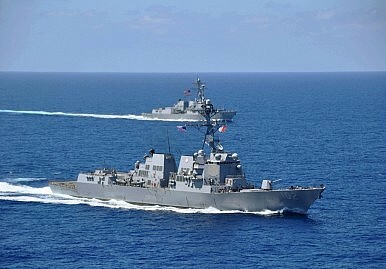 USS Sampson (DDG 102) and USS Pinkney (DDG 91) in the South China Sea. The U.S. is considering sending aircraft and ships within 12 nautical miles of Chinese reefs. How would Beijing react? A Wall Street Journal report, citing anonymous U.S. military officials, says the Pentagon is considering sending Navy surveillance aircraft as well as ships closer than ever before to reefs and islands claimed by China in the South China Sea. The change in policy, which remains under debate, would send U.S. vessels and aircrafts within 12 nautical miles of certain reefs, encroaching on what China claims as its territorial waters and airspace. That, in turn, could spark a fierce response from Beijing, which has promised to defend every inch of its claimed territory in the South China Sea. The Pentagon is seeking ways to clearly demonstrate that it does not accept China’s land reclamation and construction on reefs and maritime features in the area. According to the WSJ, the United States believes that some of the features claimed by China are reefs rather than islands according to international law, and thus not entitled to a 12-nautical mile zone of territorial waters. China’s recent land reclamations may be designed to force the international community to consider these features as true islands. By purposefully sending aircraft and vessels within 12 nautical miles of those specific features, the United States would be emphatically demonstrating that it does not agree with this interpretation. U.S. officials interviewed by WSJ likened the option to China’s own encroachments on the 12 nautical mile territorial waters of the disputed Senkaku/Diaoyu Islands in the East China Sea. In both cases, the action is important as a dramatic signal that another state’s claims to territorial water and airspace are not recognized. It’s important to note that the policy discussed by WSJ may never be put into action. This is just one of several different options Pentagon is considering for a more robust response to what it sees as Chinese assertiveness in the South China Sea. However, should the Pentagon move forward on the path described to WSJ, the stage is set for a confrontation. The United States military would be knowingly and purposefully entering an area claimed by China as its territory. How would China respond? If, as the U.S. officials quoted by WSJ suggested, the model of Chinese movements near the disputed Senkaku/Diaoyu Islands is instructive, except to see Chinese jets and vessels scrambled to meet U.S. aircraft and ships during each incursion. As part of its construction activities in the Spratlys, China is widely believed to be building new military facilities, including possible airstrips on Fiery Cross and Subi Reefs. Fiery Cross also appear to be the site of a new port capable of housing Chinese naval vessels. The Foreign Ministry has made clear that one purpose of its South China Sea construction is “better safeguarding [China’s] territorial sovereignty and maritime rights and interests” – which would include sending Chinese military assets to intercept U.S. (or any other country’s) aircraft or vessels seen as violating China’s sovereignty. Given the history of close calls (and, in 2001, an actual collision) between U.S. surveillance aircraft or patrol ships and Chinese counterparts seeking to defend their turf, this could be a recipe for disaster. Analysts already worry about the potential for a miscalculation or accident resulting in a tragic confrontation between the U.S. and Chinese militaries – if we begin to see Beijing scrambling jets against perceived U.S. incursions those risks go up substantially. Another likely consequence should the United States pursue this course: the official declaration of a Chinese air defense identification zone (ADIZ) over at least part of the South China Sea. The China-watching community has speculated on a possible South China Sea ADIZ since China declared an ADIZ over the East China Sea back in November 2013. So far, Beijing has held off but never dismissed the idea entirely. On May 7, Hua Chunying told reporters that “China is entitled to set up ADIZs.” She added, however, that such a decision “depends on whether the air safety is threatened and to what extent it is threatened.” The United States sending surveillance aircraft into what China claims as territorial airspace would definitely qualify as a threat to air safety, from Beijing’s perspective, and would likely serve as a catalyst for a South China Sea ADIZ. There’s one “X factor” in all this: the result of the Philippines’ request for arbitration over China’s South China Sea claims. Among other things, the Philippines asked the International Tribunal for the Law of the Sea for clarification on what rights certain features generate under UNCLOS. Should the tribunal rule that certain reefs do not, in fact, generate a 12-nautical mile territorial zone, then the United States would be in a far stronger position should it choose to send ships and aircraft close to Chinese occupied reefs in the Spratlys. US patrols within 12 nautical miles of China's artificial islands have a complicated legal basis.